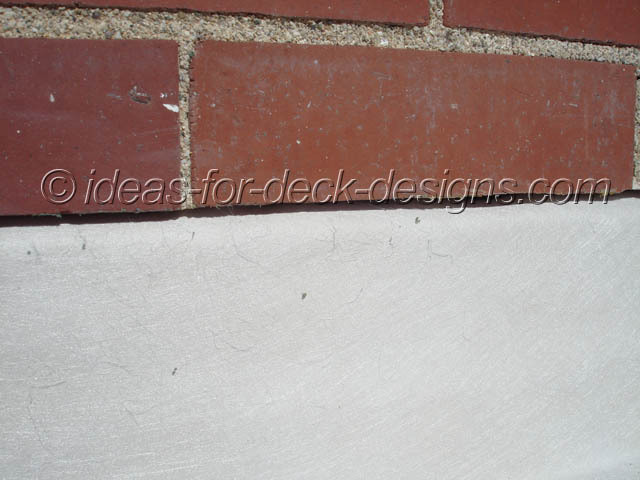 You have to prepare wall flashing so the TileDek membrane can be adhered up against the wall and also into a ringlet under the course of brick. Notice in this picture how a 2x4 has been secured to the wall. The 2x4 was used a guide for the circular saw and masonary blade to cut the mortar between bricks and form a ringlet. The guide ensures a steady and accurate cut for a nice fit with the membrane. If a membrane is very thick it can be difficult to bend it at 90 degrees and it may not stick to the substrate as well. The manufacturer may recommend a cant strip to ease the transition of the membrane from horizontal to vertical. 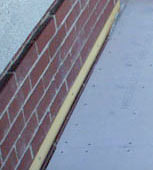 When the membrane is finally installed it will be tucked in deeply and securely underneath the upper course of brick. The end result is a very clean looking and water proof transition from deck surface to wall.